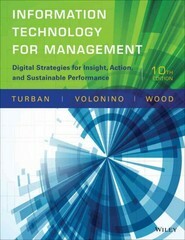 Information Technology for Management 10 Edition Information Technology for Management by Turban,Volonino, and Wood engages students with up-to-date coverage of themost important IT trends today. Over the years, this leadingIT textbook had distinguished itself with an emphasis onillustrating the use of cutting edge business technologies forachieving managerial goals and objectives. The 10th Edition continues this tradition withcoverage of emerging trends in Mobile Computing and Commerce, ITvirtualization, Social Media, Cloud Computing and the Managementand Analysis of Big Data along with advances in more establishedareas of Information Technology.